Sometimes, until the very last moment, the owner of the apartment being repaired cannot decide which floor is better to purchase. After all, they produce so much today that it is difficult to make the final choice. Especially often, many can not decide what is preferable: a laminate or floorboard. After all, both of these materials are very popular today. Parquet is environmentally friendly, reliable and luxurious, and it is easy to care for laminate flooring, and it looks quite decent. A feature of the laminated coating is its multi-layer. The layers are fibreboard and kraft paper, which are bound by polymers. On the decorative top layer applied protection, which is based on melamine resin. Due to this layer, this flooring is particularly durable. Thanks to a layer of fiberboard, the laminate acquires constant geometric dimensions, as well as the ability to withstand climatic variations. 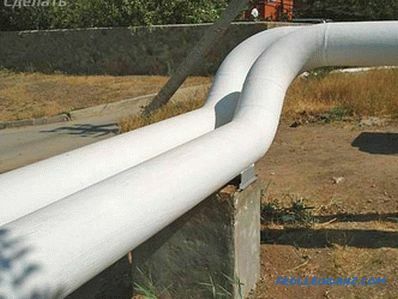 Under DVP there is another layer, which consists either of plastic or of special paper impregnated with special resin. To increase the moisture resistance of the edge of the material is treated with wax-containing impregnation. The type of laminate from the end. Laminate differs in the loads it is able to take on. It can withstand small, medium and high loads, as indicated by the corresponding marking. What type of floor to lay, primarily depends on what kind of permeability of the room. In the kitchen, for example, the load on the floor will be high, and in the nursery - medium. Slight loads will be in the room for sleeping. It does not attract dust. It easily withstands shocks and is slowly erasing. The greatest strength is the coating of classes 31, 32 and 33, which is intended for industrial and office premises. For an apartment you can use laminate of classes 21, 22 and 23. The laminate floor will not be damaged, even if it is subjected to prolonged compression. Laminate is not afraid of the sun's rays, without fading from time to time. It is also heat resistant and is not in contact with cleaning chemicals. Laminated flooring is suitable for arranging underfloor heating. Patterns, textures and colors of laminate shine with variety. The warranty on this material is 5 years. Laminate maintenance is extremely simple. In those rooms where wet, this material is not recommended. If you do not use a substrate, the insulation of such a floor from external noise will be very weak. Laminate repair is not subject. If it is damaged, then nothing can be fixed - just change. The appearance of the laminate indicates that it is an artificial material. And now we need to tell about the flooring - otherwise how we will find out how the laminate differs from the floorboard. Each parquet board, like laminate, consists of several layers. Naturally, these layers have a completely different composition. Inside the multi-layer construction - planks, glued together perpendicularly. This allows the flooring to serve for many years, without wiping and without spoiling from shocks and other loads. 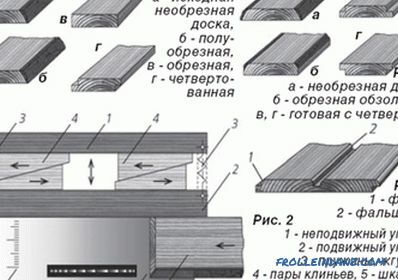 Enumerate in detail what the floorboard consists of. Let's start at the top. So, to protect against external influences, a special varnish is applied with an upper layer (or rather, several layers). Next come valuable woods. It can be oak, beech or ash, for example. The thickness of this layer is small - from 2.2 to 6 millimeters. Lamels, otherwise, narrow boards made of spruce or pine make up the central layer of the parquet. They have a side groove-thorn for connecting with the adjacent board. This layer is located perpendicular to the previous one. Spruce or pine plywood is used as the lowest layer used for structural stability, from 1 to 2 millimeters thick. Its fibers are arranged in the same way as the fibers of fine wood in the outer layer. 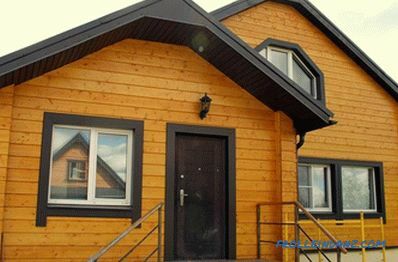 This coating very well protects against external noise, since it is made of natural wood. Also, it does not attract dust. Lacquer, which is applied under production conditions, is very durable, harmless. It does not contain toxic formaldehyde. The parquet can be polished and restored many times. The thicker its upper layer, the more times it can be done. But it is very difficult to find a master who will undertake this work. 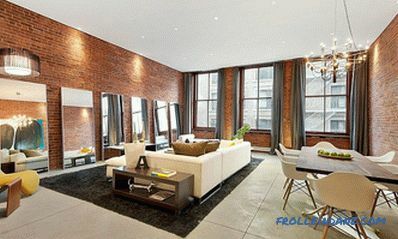 The appearance of the floorboard can not be compared with anything - it looks elegant and stylish. The texture of natural wood has a unique beauty. It is not difficult to lay the floorboard, caring for it is also simple. The manufacturer gives a guarantee for this material for 10 years, no less. In the bathroom or other room with high moisture parquet can not be laid - it does not tolerate moisture. Parquet lacquer can be erased faster than the top sheeting on the laminate. Parquet requires more careful adherence to indoor microclimate than laminated flooring. 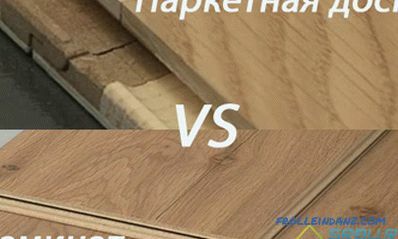 Finally, in order to find out which laminate flooring is better and which flooring to choose for your apartment, we will carry out a detailed analysis of these materials. As we learned a little earlier, they have very little in common - it is multi-layered. However, the layers are completely different. Now let's talk about the differences. Here the laminated floor comes to the first place, but on condition that it is of a higher class of operation. You can’t scratch his heel or hurt a sharp leg of a chair. Yes, and the weight he is able to withstand Pobol than the floor. Even heavy furniture can be moved with care on laminate flooring. Scarabs almost will not. But if you decide to move the closet on the floor, the floor will be scratched very quickly. Parquet does not like too dry air (it cracks), nor too wet rooms (swells). But the laminated floor perfectly transfers both. Therefore, in the winter, during the heating season, when the rooms are very dry, small gaps can occur between tightly fitting boards. Laminate will not react so - this is a plus for him. Laminate flooring was created in order to obtain a floor covering that imitates parquet, but is devoid of its shortcomings. Therefore, initially this type of coverage was even more expensive than parquet. Then there were new technologies, production reached a massive level, and the laminate fell in price. If we talk about laminate of classes 31, 32, 33, 34, which are popular today, they are in many ways superior to parquet. The fact is that they use a high density fiberboard (HDF), which slowly and evenly expands. Therefore, the cracks in this flooring is not available. What can I say - in this parameter, the noble and stylish parquet wins. If your room is decorated in a classic style, then the flooring is requested in it. It will look great next to a marble fireplace, gilt and stucco, in harmony with the paintings on the walls and antique furniture. If the apartment is decorated in one of the modern styles (modern, high-tech, eco-style), then the laminated floor itself is in it. It has so many drawings, colors, textures and patterns that you can always choose the right one for the chosen design. If the floor is to be laid not in an apartment, but in a public place, it is especially important how difficult it is to care for it. Here, choosing parquet board vs laminate, you should know that the laminated coating can be safely washed with a damp cloth every day. But pouring a bucket of water on it is not necessary to do a thorough cleaning. It is not recommended to use powder and detergents. Parquet is more gentle - it can be vacuumed, only gently, so as not to scratch. It should be wiped with a well-wrung cloth, besides, you should periodically use special compositions for tree care. Remember that in the corridor, where people walk a lot and bring dirt from the street, it will be better to use laminate. And in the kitchen such a floor will be much more practical. But in the children's parquet will be quite appropriate. Also in the bedroom, natural wood coating is more acceptable than artificial laminate. Everyone thinks that parquet is more expensive than laminate, taking it as an axiom. Although it is not quite so. It is also important who produced this material. And more importantly, from what components it is made. Much depends on the class of laminate. The stronger its coverage, the more expensive it is. So excellent laminate of high quality may well cost more than the average price of parquet. Parquet can also vary greatly in price. After all, it has a different top varnish layer and thickness. Much depends on the type of wood from which it is made. If there are knots on the parquet, different colored drawings, it will not be expensive. But if these are products of a world brand, of excellent wood without a single speck, then the price of such a parquet can be quite high. Wrong about laminate flooring and laminate - expose? Many sellers distort information trying to sell your product. Let's expose these statements, which, perhaps, many have heard. 1. So, it is often heard that the eco-friendly material of these two is only parquet. This is a lie - according to European standards, laminated flooring has the same environmental class as parquet - E1. As we considered at the beginning of this article, the floorboard consists of layers of wood, and these layers are glued together with special adhesives. Therefore, it was not without chemistry at all. 2. The fact that laminate, as opposed to parquet, is more booming, is also a false statement. It depends on the substrate and how well the base is aligned for the floor. After all, only having achieved a perfect fit of the coating to the base, you can achieve a minimum of boominess. Applying a cork substrate can achieve a better sound insulation effect. Then it does not matter that from above - parquet or laminate - there will be no booms. And vice versa. 3. As an argument of how a floorboard is better than laminate, there is a statement that the laminated flooring, unlike the floorboard, cannot be repaired. It would seem that all is true. But in practice it turns out that this is a marketing ploy and there are several nuances. The thing is that it is very difficult to find a master who agrees to restore the parquet not glued to the base. During grinding, the board may bend a little at the joints, and this is fraught with waviness. Grinding also erases the color and removes the brushing, after which the parquet will look too cheap.